When your garage door cables in Surrey snap or come off the drum, rely on our assistance. At our local business, we fix and replace cables as fast as possible. We have an expert team of well-trained technicians and each of our vans is equipped with multiple new cables and necessary tools. You can trust the fast time of our response and skills. When the pros from our Garage Door Repair in Surrey fix or replace one of the cables, they always check the cable at the other side of the door. The door is always leveled and every part of the spring and cable system is thoroughly checked. All services related to garage door cables are significant. If the cable is not properly installed, too short for the door, frayed or loose, the door won’t move and close right. You can rest assured that each of our technicians is skilled to put a cable back to its drum, but can also check the reasons why the garage door cables keep coming off. This might not be caused by a cable problem. If there is a problem with the spring or the pulleys break, the cable might come off. Incorrect installation of cables or the wrong choice of cables will also cause problems. We are installing garage door cables with great attention making sure each cable is properly wrapped around the drum and connected to the extension spring pulley or torsion spring system. Count on our quick assistance if your garage door cables broke. We respond urgently in order to replace the snapped cable and make sure the door moves right. Our experts supply you with the new cable so that you won’t waste time or get the wrong one. Don’t be reluctant to ask our help if your garage door cables came off or there is any other problem with them. We offer quality cable services fast and at affordable prices. Contact our team in Surrey, British Columbia, whenever you need help with your home cables. 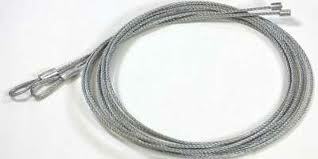 Need garage door cables Surrey repair today? Call us now.